This not just a credit card but a way of life, combining assurance and great convenience. 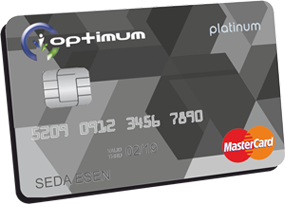 OptimumCard Platinum, provides all the facilities of OptimumCard with the additional advantage of a high expenditure limit. All over the world, at thousands of points, with its prestigious high expenditure limit, travel and insurance services and emergency support, OptimumCard Platinum aims to provide you with the highest level of ease and assurance for both shopping and withdrawals. OptimumCard Platinum provides unlimited help and support for all your needs, 24 hours a day, 7 days a week. While having your free drinks and waiting in the elegant Comfort Lounge, you can browse the Internet during your free time or conduct to your business affairs. What’s more, you can also entertain a guest for free. 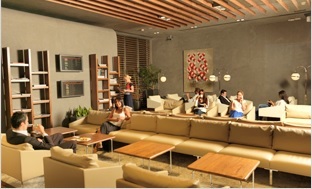 Let your children take advantage of the exclusive services of the Comfort Lounge too. There is a 50% reduction for those aged 7-12 and it's free for the under age 6.To take advantage of the Comfort Lounge services, you must have used your card within the last three months and have made regular payments. You get points with every OptimumCard transaction, not just when you use it to shop. Pay by direct debit or use your Optimum Points to pay...and get even more Optimum Points. The opportunities are limitless with OptimumCard... our Call Centre on (0392) 600 02 02, Internet branch and KOOP24 ATMs are all at your service. E-mail, SMS, Fax. You can ask for your statements to be sent to you via e-mail or fax. If you wish, you can have your payment information as a short message on your mobile phone. Don’t worry if your card is lost or stolen, just call us immediately. You will not be liable from any purchase made on your card from the moment you notify us. Get OptimumPoints with your OptimumCard... Your first points are complimentary from us. Obtaining an OptimumCard is very easy... Begin to discover the world right now. Use Optimum Instalment for your OptimumCard payments. You can take advantage of favourable shopping opportunities and payment conditions whenever you see the Optimum symbol in more than 4,000 shops/businesses. With OptimumCard you have the option to either pay in full or in interest-free instalments regardless of the payment period. Shop first,pay later anywhere in the world... You can even pay off your cash purchases in instalments! With OptimumCard spread all your single payment purchases as instalment payments at home or abroad. All you need to do to make your payments is either visit our Internet Branch online, or use our Mobile Branch via your mobile phone or tablet ,or contact our Call Centre on (0392) 600 02 02. Each of the three instalments is 34.24 TL. Paying for your 1000 TL in 12 instalments. Fee for a 12 instalment delayed %9.70 (BSİV not included). Paying for your 400 Euro purchase in 6 instalments. Dial 0 on (0 392) 600 02 02 to connect to one of our call center customer services representative. You need to request delayed instalment payment prior to the payment statement due date of the credit card used for your purchase. Purchases made on POSNet E- Commerce over the Internet are also included. İn order for your single payment purchases to be converted to delayed instalment payments, the purchase needs to appear as a debt on your card but not to be included in your due statement. Payments not made using Optimum POS Terminal can take a few working days to appear on your card, so you can request delayed instalment after this period. For single payment purchases made using Optimum POS Terminal, a delayed instalment request can be made on the same day.